A European native, also known as "bee balm", this herb takes its botanical name from the Greek word for "honey bee" as it was regarded as being as healing and curative as honey. Both relaxing and tonifying for the nervous system, lemon balm is largely used today for anxiety, depression, nervous tension, and related digestive disorders. For treating the common cold, the herb has a mild antiviral influence and helps sweat out a fever. Daily consumption of the fresh juice or succus may assist in regulating hyperactive thyroid - potentially helpful in treating goiter and Grave's disease. 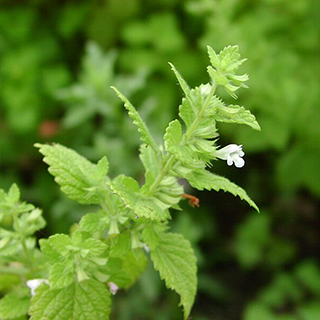 Lemon balm improves the taste and activity of other herbs. When used in combination with laxatives, it has a complimentary antispasmodic effect. Drink 1 cup (2–3 tsp fresh or dried leaves per cup boiling water) 3 times daily for depression, nervous exhaustion, indigestion or nausea; use a dilute infusion for children suffering from chicken pox. Use on sores, cold sores, poorly healing wounds, or insect bites. Add 20 drops (1ml) of essential oil to 31/2fl oz (100ml) of water in a spray bottle and spray on skin to repel biting insects. Take 10–20 drops in water 3–5 times daily for depression, tension headaches, and anxiety. Best made from fresh leaves. Add 5–6 drops of essential oil to 1 tbsp (15ml) of almond oil and use as a massage for depression, tension, asthma, and bronchitis, or dab on cold sores at the first sign of symptoms. The fresh leaves may be juices and taken straight. Prefers moist, well-drained soil, but thrives in poor soil and tolerates full sun or shade. Sow seeds in a cold frame in spring and transplant when well established, or divide roots in spring when growth starts to appear in autumn. Self-seeds, but can be invasive. Less vigorous variegated or golden cultivars are an alternative option. Gather the aerial parts just before the flowers open in summer, and the leaves throughout the growing period.